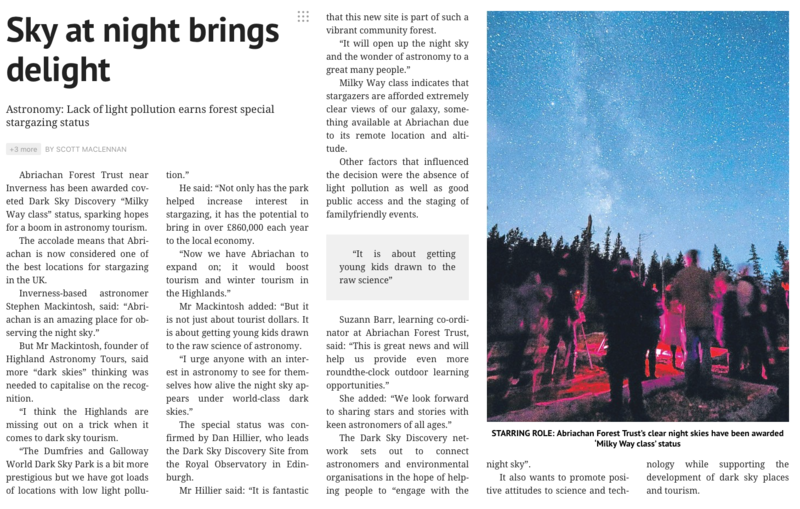 I was delighted to help Abriachan Forest Trust gain ‘Milky Way’ Dark Sky Discovery status this month after working on a joint nomination with Abriachan’s learning coordinator Suzann Barr. This is the first site in the Inverness area to be awarded the status and it’ll hopefully attract winter tourism and lots of opportunity for astronomy based public engagement. The Highlands really are blessed with excellent dark skies – we just need to do more to capitalise on it and perhaps emulate some of the great work that’s been done in the Scottish Borders where the Galloway International Dark Sky Park brings substantial benefits to the local economy. After the status was formally awarded by Dan Hillier (who leads the Dark Sky Discover network from Edinburgh’s Royal Observatory) I generated a press release which several news bodies picked up, not least BBC Scotland. Link to BBC Scotland Article.